FIGURE 1. Mouse brain was cross-linked and disaggregated into a single-cell suspension using a Dounce homogenizer. The chromatin was prepared and digested, and chromatin immunoprecipitations were performed using the indicated ChIP-validated antibodies. Purified DNA was analyzed by quantitative real-time PCR using SimpleChIP® Mouse GAPDH Intron 2 Primers #8986, SimpleChIP® Mouse RPL30 Intron 2 Primers #7015, SimpleChIP® Mouse HoxA1 Promoter Primers #7341, and SimpleChIP® Mouse HoxD10 Exon 1 Primers #7429. The amount of immunoprecipitated DNA in each sample is represented as signal relative to the total amount of input chromatin (equivalent to 1). FIGURE 2. Mouse liver was cross-linked and disaggregated into a single-cell suspension using a tissue disaggregator. The chromatin was prepared and digested, and chromatin immunoprecipitations were performed using the indicated ChIP-validated antibodies. Purified DNA was analyzed by quantitative real-time PCR using SimpleChIP® Mouse GAPDH Intron 2 Primers #8986, SimpleChIP® Mouse AFM Intron 2 Primers #7269, SimpleChIP® Mouse HoxA1 Promoter Primers #7341, and SimpleChIP® Mouse HoxD10 Exon 1 Primers #7429. The amount of immunoprecipitated DNA in each sample is represented as signal relative to the total amount of input chromatin (equivalent to 1). FIGURE 3. Mouse brain or mouse liver were cross-linked and disaggregated into a single-cell suspension using a Dounce homogenizer or tissue disaggregator, respectively. The chromatin was prepared and digested, and chromatin immunoprecipitations were performed using the indicated ChIP-validated antibodies. 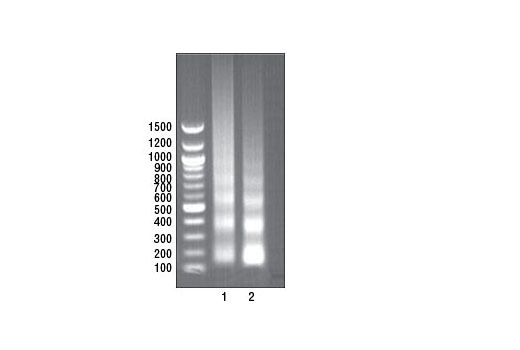 DNA was purified and 10 μl was separated by electrophoresis on a 1% agarose gel and stained with ethidium bromide. The majority of chromatin from both brain (lane 1) and liver (lane 2) was digested to 1 to 5 nucleosomes in length (150 to 900 bp). Specific for product: SimpleChIP® Plus Enzymatic Chromatin IP Kit (Agarose Beads) #9004. Centrifuge cells at 2,000 x g in a benchtop centrifuge for 5 min at 4°C. Remove supernatant and continue with Nuclei Preparation and Chromatin Digestion (Section III). (SAFE STOP) Alternatively samples may be stored at -80°C for up to 3 months. To each RNAse A-digested sample, add 2 µl Proteinase K #10012. Vortex to mix and incubate samples at 65°C for 2 h.
Resuspend ChIP-Grade Protein G Agarose Beads #9007 by gently vortexing. Immediately add 30 µl of ChIP-Grade Protein G Agarose Beads to each IP reaction and incubate for 2 h at 4°C with rotation. NOTE: The ChIP-Grade protein G agarose beads are blocked with sonicated salmon sperm DNA and are not compatible with ChIP-Seq. Pellet protein G agarose beads in each immunoprecipitation by brief 1 min centrifugation at 3,400 x g in a microcentrifuge and remove supernatant. Wash ChIP-Grade protein G agarose beads by adding 1 ml of low salt wash to the beads and incubate at 4°C for 5 min with rotation. Repeat steps 6 and 7 two additional times for a total of 3 low salt washes. Pellet protein G agarose beads in each immunoprecipitation by brief 1 min centrifugation at 3,400 x g in a microcentrifuge and remove supernatant. Immediately proceed to Section VI. Elute chromatin from the antibody/protein G agarose beads for 30 min at 65°C with gentle vortexing (1,200 rpm). A thermomixer works best for this step. Alternatively, elutions can be performed at room temperature with rotation, but may not be as complete. Clarify lysates by centrifugation at 9,4000 x g in a microcentrifuge for 10 min at 4°C. Optimize the PCR conditions for experimental primer set using purified DNA from cross-linked and digested chromatin. Design a different primer set and decrease length of amplicon to less than 150 bp (see primer design recommendations in Section VIII). For optimal ChIP results add 5-10 µg chromatin per IP. See recommendations for problems 1 and 3 above. The SimpleChIP® Plus Enzymatic Chromatin IP Kit (Agarose Beads) #9004 contains the buffers and reagents necessary to perform up to 30 chromatin immunoprecipitations from cells or tissue samples, and is optimized for 4 X 106 cells or 25 mg of tissue per immunoprecipitation. A complete assay can be performed in as little as two days and can easily be scaled up or down for use with more or less cells or tissue sample. Cells or tissue are fixed with formaldehyde and lysed, and chromatin is fragmented by partial digestion with Micrococcal Nuclease to obtain chromatin fragments of 1 to 5 nucleosomes. Enzymatic fragmentation of chromatin is much milder than sonication and eliminates problems resulting from variability in sonication power and emulsification of chromatin during sonication, which can result in incomplete fragmentation of chromatin or loss of antibody epitopes due to protein denaturation and degradation. Chromatin immunoprecipitations are performed using ChIP-validated antibodies and ChIP-Grade Protein G Agarose Beads. After reversal of protein-DNA cross-links, the DNA is purified using DNA purification spin columns, allowing for easy and efficient recovery of DNA and removal of protein contaminants without the need for phenol/chloroform extractions and ethanol precipitations. The enrichment of particular DNA sequences during immunoprecipitation can be analyzed by a variety of methods, including standard PCR and quantitative real-time PCR. Please note that this kit is not compatible with ChIP-seq because the ChIP-Grade Protein G Agarose Beads are blocked with sonicated salmon sperm DNA, which interferes with downstream sequencing. The SimpleChIP® Plus Kit also provides important controls to ensure a successful ChIP experiment. 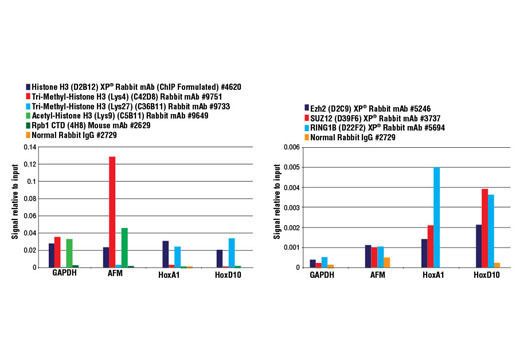 The kit contains a positive control Histone H3 Antibody, a negative control Normal Rabbit IgG Antibody and primer sets for PCR detection of the human and mouse ribosomal protein L30 (RPL30) genes. Histone H3 is a core component of chromatin and is bound to most DNA sequences throughout the genome, including the RPL30 locus. Thus, the Histone H3 Antibody provides a universal positive control that should enrich for almost any locus examined. 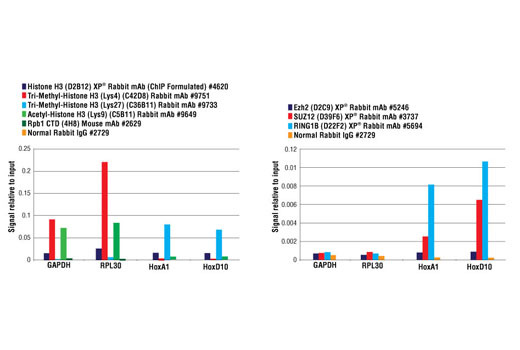 The SimpleChIP® Plus Enzymatic Chromatin IP Kit can be utilized with any ChIP-validated antibody to detect endogenous levels of protein-DNA interactions and histone modifications in mammalian cells and tissue samples (see Figures 1 and 2). The positive control Histone H3 Antibody recognizes many different species of the highly conserved Histone H3 protein, including human, mouse, rat and monkey. Primer sets are included for the human and mouse positive control RPL30 gene loci; however, the use of other species with the kit requires the design of additional control primer sets. Wang, J.D. et al. (2015) Autophagy 11, 2057-2073.